Environmentally Friendly Material: PLA filaments are made with polymerized lactic acid, which is extracted from corn, sugarcane or other sugar-containing crops, and is regarded as the most environmentally friendly 3D printing material. Unwanted PLA printed objects can be simply discarded in the soil where it will naturally decompose. PLA filaments print in bright colors and at a safe, low temperature making it a favorite among our users as well as perfect for family settings. 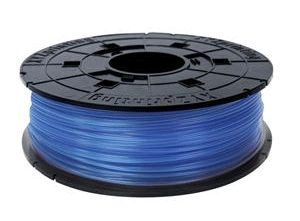 PLA plastic placed in an environment or water bath exceeding 50° C (122° F) will soften and deform. Hence, properly seal and store all unused PLA filaments in dry, cool areas. Enjoy the pleasant sugary scent emitted by the PLA filament give during printing. More PLA filament colors to choose from. XYZprinting's vividly colored filament is engineered and tested to make sure that there is no distortion in the color and form of the filament. Easy to Install: Simply replace the filament spool in the da Vinci Jr. /Mini to make refilling easier than ever before! Our new PLA filaments are a non-toxic,biodegradable plastic that is recyclable and safe for the environment!